Drawing Parallels, a two-person exhibition, features large-scale drawings by Amie T. Rangel and hand printed lithographs by Matthew Rangel at the Corridor Gallery in downtown Fresno. The opening reception, part of Fresno Art Hop, is on Thursday, April 4, from 5 – 8 p.m. The Rangel’s create artwork using similar formal sensibilities although they explore different, yet parallel, subject matter that is relevant to the Central Valley. Matthew’s work, which is primarily multi-layered original lithographs, aims to link the natural to the human and embody the physical aspects of landscape through land-based research and personal narrative. 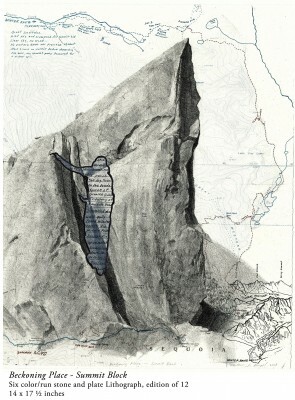 His images consist of observation-based drawings, photographs, topographic and historic maps, along with personal narratives that are generated from his walks and explorations from the valley floor to the high Sierra. Among his pieces in the exhibition, is a 16-foot scroll-like cross section of southern Sierra Nevada. Amie’s large-scale charcoal and mixed media drawings observe and investigate the industrial scope of a dairy – milk production facility located in Tulare County. The combination of large drawings along with several small lithographs conveys structural observations of spatial constructs within modern human society. Matthew and Amie T. Rangel both have a Master of Fine Arts degree from the University of Alberta and a Bachelor of Fine Arts degree from CSU Long Beach. They are currently Adjunct Professors of Fine Art at College of the Sequoias, where they are alumnus. Since returning to the region, the Rangel’s have become an integral part of cultivating a sense of purpose for the fine arts in the community at large by contributing to numerous projects, events, and committees. Please visit rangelstudio.com to view images of Amie and Matthew’s work. Drawing Parallels will be on display from April 4 – April 21. 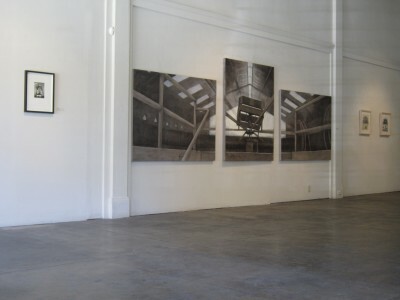 The Corridor Gallery is located at 2122 Mono St. in Fresno. The gallery has limited hours, Saturday and Sunday from 12 – 4 p.m. For further information call (559) 441-0012 or Email info@corridor2122[dot]com.